Ascot Vale, a residential suburb between Flemington and Moonee Ponds, is 6 km north-west of Melbourne. Its western boundary is the Maribyrnong River and its eastern boundary is the Moonee Ponds Creek. Until 1998 the suburb of Travancore was partly in Ascot Vale. Ascot Vale's eastern sector is transected by Mount Alexander Road, the main route to the gold diggings at Bendigo and Castlemaine (1851). Its name probably survives from its proximity to the Flemington racecourse, as Ascot is a famous English racecourse. 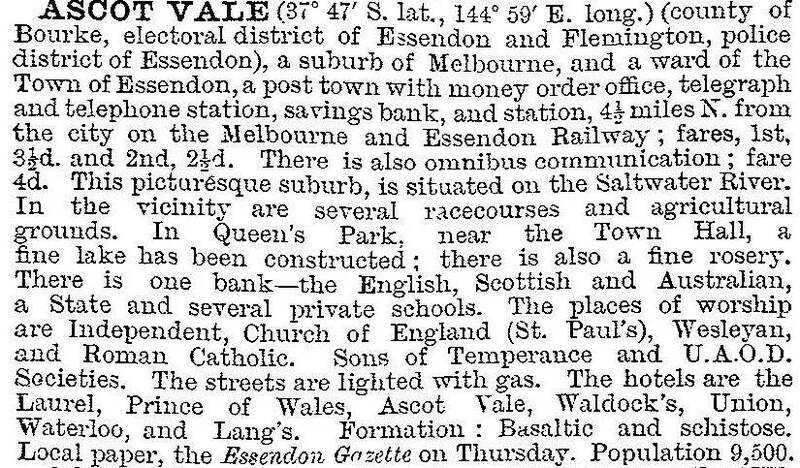 In 1860 the railway line from Melbourne to Essendon was opened, with a station at Ascot Vale. At about the same time Melbourne's Lord Mayor, John T. Smith, built Ascot House, in Fenton Street, overlooking the Moonee Ponds Creek valley. Most of the property was sold off in the 1880s. The remaining part was sold off after 1910. Some of it was flood prone and was used for a seasonal golf links. Closer to Mount Alexander Road and the railway line, residential settlement increased in tempo during the 1880s. Congregational, Presbyterian, Methodist and Anglican churches were opened between 1885 and 1889. The Ascot Vale primary school was opened in 1885, replacing the Flemington school. In 1883 the National Agricultural Society of Victoria (later 'royal'), acquired its showgrounds site in Ascot Vale West, next to the Flemington racecourse. A small shopping centre developed next to the railway station, but the main centre grew in Union Road, about half a kilometre westwards. Many of the shops were built between 1886 and 1890. Union Road was on the boundary of an 1882 estate, named Temperance Town, extending westwards to Epsom Road, which carried a covenant forbidding the making or sale of alcohol. Consequently a notable hotel was built on the opposite side of Union Road. Between Union Road and Ascot Vale Road there was the Ascot racecourse, which became one of John Wren's metropolitan courses in 1905. Ascot Vale West became more accessible when the tram line along Maribyrnong Road, from Flemington to Maribyrnong, was opened in 1906. The line ran along Union Road, but Puckle Street was favoured with a branch line in the same year, from the Mount Alexander Road tram to the Moonee Ponds railway station at the other end of the Puckle Street shops. The Ascot Vale West primary school opened in 1916 and the Anglican church in 1913. There had been an earlier Maribyrnong estate (1885) near where the Raleigh Street bridge crossed the Maribyrnong River, situated on a prominent basaltic rise overlooking the Maribyrnong alluvium flood plain (now Fairbairn Park). However, the flood prone area, showgrounds, Ascot racecourse and land later occupied by ICI research laboratories constituted half of Ascot Vale West. Rather later than the Protestant churches, a Catholic church opened in 1912. Its school opened the following year, staffed by sisters from the large Mercy Convent and teaching college (1909) in Mount Alexander Road. The college became the Mercy campus of the Australian Catholic University. It was built on the Ailsa estate, which was established by the prominent brewer, Robert McCracken, who was also a member of the Essendon council and the football club. Ascot Vale central is composed of a wide mixture of house styles, from boom style brick and render to weatherboard cottages. Many have been refurbished, particularly the cottages. The shops in Station Avenue have completely gone, being converted to small professional premises or dwellings. The shops in Union Road constitute an active strip with substantially authentic architectural styles from the turn of the century. The later New Ascot Theatre is externally intact. Ascot Vale's other theatre, the Waratah, opened in 1925, the year after the New Ascot. Its site was cleared for a service station in 1959. The nearby Ascot racecourse became rundown and was a postwar housing commission estate, with street names commemorating Australian and other war commanders. It includes walk-up flats with shared facilities, an answer to postwar shortages. Ascot Vale has a large park next to the Maribyrnong River and two other reserves west of Epsom Road. The smaller of these, Victory Park, was named after World War I. The remainder of Ascot Vale's open space is confined to linear reserves along the Moonee Ponds Creek, part of which is the Essendon hockey centre. Pupil enrolments were: Ascot Vale primary (255), Ascot Vale West primary (283) and Ascot Vale Special school (105).